All of the following facilities are based on the Hamilton Campus. Facilities at all other campuses are limited. The Cafeteria is located on the ground floor of the main hospital building in Hamilton. Visitors are welcome to use the facilities. The cafeteria is open Monday to Friday, except public holidays. Click here for further information. Western District Health Service has a chapel located off the corridor from the Education Centre to the Hamilton House Allied Health Centre on the main campus in Hamilton. Church services are held regularly by local Ministers on a rotational basis. Patients and visitors are able access the chapel at any time. If you wish to see your minister, priest or pastoral visitor, please discuss with any of our staff and arrangements will be made. A public telephone is located in the main reception. 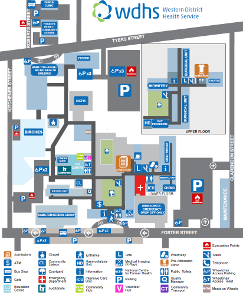 Public toilets are located on both floors of the main hospital campus and opposite the library. Please ask any of our staff if you require directions. See the Community Information for information on other local services.